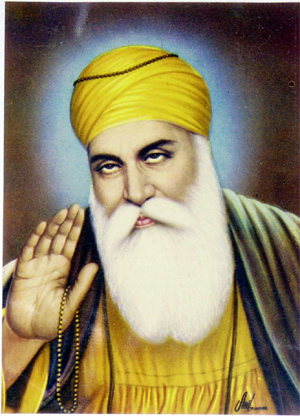 Today (November 21, 2010) is Guru Nanak Dev Jayanti. Guru Nanak ji is one of the tallest saints of India. A strong non-believers in rituals, he worked for the unity of the Hindus and Muslims, and had Bhai Bala and Mardana as his close associates. His love and devotion for god was evident from a tender age of five, and when 18 he had mastered not only Persian, Sanskrit, Urdu, Punjabi and some more Indian languages, but also the tenets of true religion that consisted of mercy, happiness, devotion, compassion, peace, harmony and adventure. He profounded 'Sikhism' (sikh means disciple) based on universal brotherhood and truth and 'secularism' in true sense of the word. Nanak ji composed a set of 38 verses, called 'pauri' (step), based on his spiritual experiences. This is called Japuji sahib, the morning prayers, that form the first chapter of Sri Guru Granth Sahib. His insight has the divine fragrances of the holy Gita, the teachings of Lord Buddha and sufi thoughts. It may be a surprise to many that Sri Guru Granth Sahib has couplets of saints like Kabir ji and Farid making the holy scripture truly a confluence of all religions - universal and secular! Sikhism spread to many countries like Myanmar (then Burma), Tibet, Iraq and Sri Lanka. Today we have sikhs live across the world. Guru Nanak ji was born in the year 1469 to Kaluchand and Tripta Devi at Rai Bhoeki Talwandi, later called Nanak Sahib, now in Pakistan. He was married to Sulakshana Devi and had two children. The worldly pleasures couldn't tie this saint for he had a higher calling. He left home in search of truth. At the age of 70 he went into 'samadhi' in 1538. Angad, his disciple, and not his son, succeeded him. On this sacred day of Guru Nanak jayanti let us say our prayers and be determined to follow his path of religious harmony, peace, mercy and happiness. Thank you, Gurupreet ji for your kind information on Guru Nanak Dev ji. Thank you, Raman ji. Guru Nanak Dev ji is a tower of Indian spirituality. A great social reformer, he was modern, far ahead of his time. His teachings will hold good for ever. Thanks very much for the wonderful write up of Shri Guru Nanak. Believe me, I have found that having a photograph of Shri Guru Nanak is not only auspicious but also very lucky.